Dobbin & Sullivan – Now that General Permitted Development Order has been made a permanent fixture D&S look at the policy and its impact in more detail. Following the success of the relaxation of Permitted Development Rights (PDR) to allow for conversion from some commercial uses to residential, the government announced in its March budget that the changes made in 2013 will be permanent. The introduction of permitted development was led by two driving forces; a chronic lack of housing and an overabundance of office space. This lack of housing has been a concern for the current government throughout their time in power, including during their coalition with the Liberal Democrats with numerous promises for an ever increasing delivery of new homes. The price of housing has been escalating continuously, nowhere more so than in London. In regard to issues with office space, the prevalence of empty premises was pushing away investors due to the heavy losses that can be incurred through empty rates if the property fails to let. This is of course down to simple economics of supply and demand, a lack of supply will ramp up prices in residential and vice versa with the abundance of offices. This lack of supply in residential is further increased when such a high proportion of new build homes are tailored to overseas investors instead of owner occupiers. As such, B1 office space was allowed to change to C3 residential space without planning permission (prior approval is still needed) in the hope of supplying (relatively) affordable housing. JLL research estimates that during the first two years of the scheme 8000 prior approvals were made countrywide, with 3500 of these in greater London – if every one of these was implemented it would create approximately 60,000 homes. This is, however, not the case. A second use has been found for the permitted development, with prior approval so easy and cheap to obtain many landlords are using it to trump problematic tenants who believe they hold all the card when it comes to a lease renewal. The lack of conversion rate is also attributed to many developers using the PDR as a bargaining chip to achieve a more substantial office to residential scheme. A final reason for introducing the scheme is the threat to green field land, particularly green belts around major cities. Utilising empty office space for residential development should limit greenfield developments as the planning process is far less rigorous and build times are much shorter. One very significant change implemented with the move to PDR becoming permanent are a lax in the demolition laws. One challenge was the difficulty in converting office blocks with challenging floor plates and low ceiling heights in to residential use. Now, many blocks will be allowed to be demolished without planning permission. Now that the change in rules has become permanent there have been some additional amendments. Below is an overview of all uses which can be converted to a C3 residential dwelling. Additionally, the government has outlined several areas of the country which are not included under permitted development until a review in May of 2019. The most significant of these are the City of London which is seen as a “nationally significant area of economic activity”, Manchester City Core and the Royal Borough of Kensington and Chelsea. There are many other small areas dotted around the country and particularly London that remain exempt – details of which are mapped out at www.gov.uk. 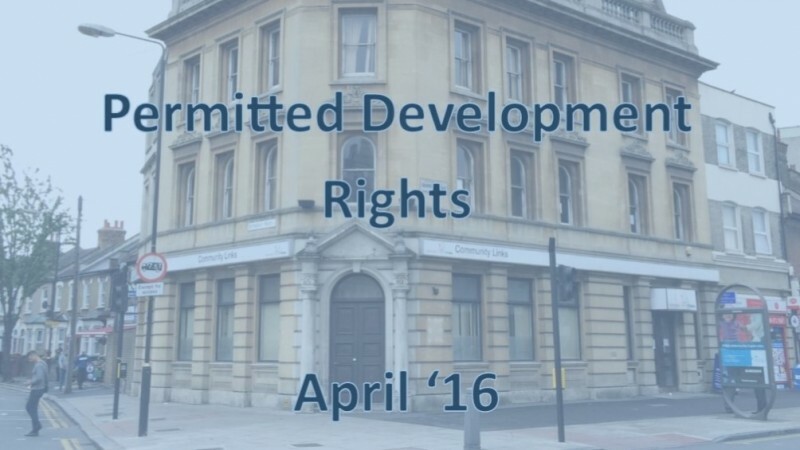 If the building is listed or a scheduled monument, permitted development rights are waived and any development must go through the normal planning application process. Once approval is granted the change of use must be implemented within three years or it becomes void and approval will need to be sought again. The obvious issue this has caused is a lack of office space as residential will almost always be more valuable, as such any property owner with the opportunity to utilise PDR is capitalising – naturally this may cause office rents to rise which will prove problematic for small business. That said, the office market is still plentiful and values have not risen dramatically as yet. One other issue sparked by PDR is an increased pressure on local councils. The success of the scheme has caused a lot of additional work for local councils but as PDRR is relatively cheap to apply for, it does not bring in a huge amount of revenue for local councils. It could be argued that this balances out as there are to be less planning applications submitted which are protracted and time consuming for local councils. DTZ believes this could save councils £10,000 per year. There is also a worry that with slackened planning regulations there will be a plethora of poor housing stock, particularly with developers who are new to the industry and try to cut costs and corners. On balance however the scheme justifies becoming permanent as it has brought new life to dated and tired areas of towns and cities littered with empty office space. Furthermore, it has seen more affordable housing appear and many of the flats that have been bought are being bought by people new to the market.